For a while there, I was wondering if I should apologize to Jackie. After all, it was the Mariners’ pitchers who gave up those three runs in the eighth inning to give her Orioles hope. But on further reflection, I don’t think I will. Even after the Ms won the game, the Orioles still had a 57-55 record. Even after winning the game, the Mariners were still eight games under .500. The Ms just needed the win more. And that whole “home teams won all fifteen games” thing is kinda neat. You all know how much I enjoy seeing something that’s never happened in baseball before. Something else I’m not going to apologize for: Yesterday’s Mariners’ victory over the Orioles. The Os are still a game over .500, the Ms’ are still seven games under. And, more importantly, in a disappointing season, the Mariners gave their fans something to be unequivocally delighted about. Rather, pitcher Hisashi Iwakuma did it. I talked about no hitters last year when Tim Lincecum did it for the Giants, so I won’t repeat any of the general facts here. A few specific facts: Kuma’s no hitter was the first one in the American League since 2012. The previous one was Felix’ perfect game, and the one before that was the unprecedented “six different pitchers contributed” no hitter. So the Mariners have the last three no hitters in the American league. Nifty. More to the point, it’s a peak performance for Kuma*. For the past couple of seasons, he’s fought injuries that have prevented him from showing his full potential. It’s a relief to see him overcome his problems and remind us all why we love him. * I’m on record as believing that no hitters and perfect games can’t be credited entirely to the pitcher, and I stand by that. But even with all the help the team provides in the field, it still takes a pitcher at the absolute upper edge of his abilities–as well as a lot of luck–to make it happen. So, sorry Jackie. No apologies. But your boys can rest up on their day off today and enjoy the perfect weather here in the Bay Area. Tomorrow they face the As; I hereby give them permission to sweep the series–regardless of the possible negative impact on the Mariners’ planned September miracle–because that’s just how I feel about the As. The Mariners also have today off–they’re heading for Boston–and I’ll spend today savoring yesterday’s display of brilliance. Apparently the Mariners think so. But let me back up a little. We’re about a third of the way through the season. As usual, there have been a few surprises. Of course there have. Who would want to watch if everything could be predicted before the season started. Houston, widely expected to underwhelm their remaining fans again, is 34-20–the second-best record in baseball. Alex Rodriguez [spit], widely expected to literally fall apart, shedding bits of anatomy every time he swung the bat, has eleven home runs in 178 at-bats*. Seattle, widely expected to do more or less what Houston has been doing, hasn’t been over .500 since the third day of the season, and is currently at 24-29–the eighth-worst record in baseball. * That gives him 665 home runs for his career. If there’s any justice in the way the universe works, the next time he hits one over the fence, a bottomless pit will open under his feet as he rounds third. Not only will his resulting eternal plummet prevent him from touching home, thereby resulting in his being called out, but the unfillable pit will force the Yankees to play the remainder of their games on the road. Kudos to the Astros–and I think I’ve made my feelings about A-Rod [spit] clear–but as you might have guessed, I’m here to talk about the Mariners. It’s around this time of the year that teams start deciding whether they have a legitimate shot at the playoffs. That’s a decision that will determine what they do as the Non-Waiver Trading Deadline approaches–will they be trading away prospects to fill a few gaps in the roster, or trading away current players to improve their position in the future. What are the Mariners thinking about their chances? I don’t have a clue, and quite honestly, I don’t think they do either. A couple of paragraphs back, I mentioned they haven’t been above .500 since their record fell to 1-2. They have gotten to .500, most recently last week at 24-24, but they’ve followed each approach to respectability with a losing streak. Apparently the latest losing streak (five games and counting) convinced them it was time to make a change. Shortly after they were swept by the Yankees (now four games over .500 thanks largely to those three wins), they traded their backup catcher*, a relief pitcher who’s had rough outings lately, and two prospects for a bag of magic beansMark “Big Trombone” Trumbo and a competent pitcher few people outside of Arizona have heard of. * Poor Welington Castillo. The Mariners just picked him up in a trade a couple of weeks ago. All he wants to do is play baseball, and here he is spending more time packing and unpacking his suitcase than he is in games. It’s a perplexing deal–and believe me, the professional commentators are just as perplexed as the fans. The Mariners’ biggest problems recently have been in getting runners on base* and holding leads when they manage to get them. * You can only do so much with solo home runs. Generally speaking, you need to string a few hits and walks together, get men on base, and then either bring them in one at a time with a few more hits and walks or all at once with a home run. The Mariners have been trying–unsuccessfully–to disprove the general rule. They’ve hit 62 home runs, fifth best in baseball, and have scored 192 runs, third worst in baseball. What do their new acquisitions bring? Well, the pitcher, Nuno, might help them hold leads. By all accounts, he’s been reasonably effective in limited action. Even average would be an upgrade over the recent performance of the man he’s replacing, so there’s that. But Trumbo’s only baseball skills seem to be hitting home runs and striking out*. Add his nine HRs so far this year to the Mariners’ total, and they’d move up to number three on the list instead of number five, but those nine additional runs–because, the way the Ms haven’t been getting men on base would mean they would likely have all been solo shots–would only move them up from twenty-eighth to twenty-sixth in runs scored. That’s a negligible difference. * It’s not true that he got his nickname because he fields the ball as though he was using a trombone instead of a glove, but it’s an almost-plausible bit of folk etymology. So, getting back to my original question, is it time to panic? Honestly, I don’t think so. There are still more than enough games left for the Ms to turn it around and squeak into the playoffs. But I’m not sure their management agrees. To me, the Trumbo deal smells like a “doing anything is better than nothing” move. It may not be rearranging deck chairs on the Titanic, but it’s at least on par with repainting the Bay Bridge. As I write this, before any games have started on Tuesday, the Tigers have played 40 games and the White Sox and Diamondbacks have played 46. Everyone else is somewhere between those extremes, so we’re about as close as we’re going to get. This is the point in the season where the official litany changes from “It’s still early!” to “There’s Plenty of Baseball Left!” For the teams struggling to stay conscious, TPoBL means “We can still turn it around,” while for the current front-runners, it’s more of a cautionary reminder: no division or wild card lead is safe at this point, even Detroit’s current 7 game lead. You might think that’s intuitively obvious, but to many fans, that doesn’t seem to be the case. The old mutual fund disclaimer* applies in spades. Just ask the Giants’ fans. Last year at this point in the schedule, the Giants were 25-20, one game behind the Diamondbacks, and visions of a third World Series in four years were playing the part of sugarplums in the fans’ dreams. At the end of the year, their record was 76-86, 16 games behind the division-winning (and much-hated) Dodgers. That’s why they play 162 games. Broadcasters are overly-fond of reminding us, the season is not a sprint. Annoying as the constant refrain may be, it’s certainly the truth. Anything can happen in a stretch that long. What else is going on? Well, let’s see. Last year’s playoff darling Pittsburgh Pirates are currently 18-25, hoping to climb back into relevance by the All Star Break and then make a late run at the division. Side note: If the playoffs started today, the AL would be represented by the Yankees, Tigers, As, Angels, and Orioles. The NL would have the Braves, Brewers*, Giants, Rockies and either the Cardinals or Nationals. That’s three, maybe four (depending on the results of the Cards/Nats elimination game), of last year’s playoff teams. * This season’s feel-good team, the role held by the Pirates last year? Milwaukee has but a single World Series appearance. That was in 1982, and they lost in seven games to the Cardinals. But don’t anoint them just yet: The Nationals joined the league in 1969 (as the Montreal Expos) and have never been to the World Series. Washington’s last World Series was in 1933, when the then Washington Senators lost to the then New York Giants. Kinda sounds like the Nationals should be the feel-good team, right? Maybe. In 1961, the Senators moved to Minneapolis and became the Twins, who have six World Series appearances, most recently winning it in 1991. The next incarnation of the Senators moved to Texas in 1972, where they have two World Series appearances (2010 and 2011). So if nothing changes over the next 119 (plus or minus 3) games, I’m going to hand the palm to the Brewers. But really, who says there’s no room for hope? If 60% of the playoff teams change every year, there’s plenty of opportunity for last year’s cellar dwellers to turn it around. Why, just look at last year’s whipping dogs, the Marlins (.383) and Astros (.315)! So far this season, the Marlins are at .511 (23-22), squarely in the chase for the NL East, and the Astros are a blistering .378, on pace to lose 100 games… Oh. Uh, hey guys? There’s Plenty of Baseball Left! This is not a baseball post. It is a brief philosophical ramble couched in terms of baseball. Yeah, OK, it’s a baseball post. Deal. “It was the best of times, it was the worst of times.” Well, maybe not. Aside from the fact that the line has been used before, things could be both better or worse. The past week has been a vexing one for Mariners fans. We learned on Friday that in a stunning display of competence, the Mariners have landed Robinson Cano, unquestionably the best free agent available this year and widely considered one of the half-dozen best current players. That the Mariners grabbed him away from the hated Yankees made it all the sweeter. Not everyone was thrilled with the deal (10 years, $240 million). Many commentators point out that this is Alex Rodriguez territory in terms of time, dollars, and expected career path (10 years, $250 million, declining rapidly in the later years). (The counter-argument here is that the Mariners have the money available, and if they’re overpaying for the last few years of the deal, they’re underpaying for the first few.) Interestingly, I haven’t seen anyone suggest that it could be Barry Zito territory (7 years, $126 million, largely stinking from day one); nothing is certain in baseball, after all. From the fans’ perspective, there’s nothing not to like about the deal. It gives the Mariners’ fans hope, something that’s been sorely lacking the last few years. The adage “You have to spend money to make money” holds true in baseball* as elsewhere. The Mariners have failed to spend money for years; now we have a reason to hope that they’ll dig deep and pick up a few more needed pieces. Cano can’t rescue the team by himself, but he’ll certainly help (well, as certain as anything is in baseball). * The As are a weird outlier here. On a consistent basis, they get more performance for fewer dollars than anyone else. Clearly, they’re investing something other than money. Since the Mariners are not the As, however, I’m going to figure that the rule applies. From ownership’s perspective, it’s a win-win deal too. As noted, the money is available to get the deal done, and just having Cano on the team will give attendance a boost. More butts in seats and more eyes on TV screens equals more money coming in. At this point, even a modest improvement in the team’s performance–especially if they get off to a fast start–should mean big dollars all season. * Known in our family as “Bloodmouse”, due to a misread of his jersey in his first season. It can be tough to fit a long name across the shoulders of someone as skinny as he was that year. A few folds here and there, and you can see where the confusion arose. So the weekend started on a high note. Then came Sunday. The Seattle Times ran a story which paints the Mariners upper management as incompetent meddlers who essentially sabotaged their own plan to rebuild the team by second-guessing the managers’ on-field decisions and abandoning the use of worthwhile player rating statistics. That everything the article said seems to confirm what fans have suspected for years only added to its perceive credibility. Way to harsh our buzz, guys. Let’s take a deep breath and step back for a second. Even in the worst case, this isn’t the end of the world. Assume for the moment that everything in the article is absolutely true. That would mean that the Mariners have come close to competing despite the best efforts of the guys in charge to foul things up. OK, maybe not “one good player” or “one good break” away from competing, but a .500 season has been in sight multiple times. Furthermore, you have to figure that agents, who spend much of their time dealing with upper management would have to have some inkling of what’s been going on. And yet the Cano deal came together. Other significant free agent deals over the last few years have come together. Remember what I said about money just a few paragraphs ago. If the dollars are there, deals will get done, regardless of the competence of the suits involved. And even in this doomsday scenario, if enough deals get done, the sheer competence of the players can overcome the incompetence of management. In the real world, of course, it’s unlikely that everything in the Times’ story is completely true. Maybe the GM is throwing darts at a dartboard to pick his free agent and trade targets, or maybe he knows what he’s doing. We can’t tell from outside. All we can do is keep telling ourselves that the light at the end of the tunnel might not be a train. It was the pretty good times, it was the fairly sucky times, it was the age of wisdom, it was the age of foolishness, it was the epoch of belief, it was the epoch of incredulity, it was the season of Light, it was the season of Darkness, it was the spring of hope, it was the winter of despair, we had everything before us, we had nothing before us, we were all going direct to Heaven, we were all going direct the other way. In short, it was the off-season, just like every other off-season. What if they planned a baseball game and nobody came? The official word is that the game would be played. MLB will sometimes not reschedule a game that gets canceled due to weather if it has no playoff implications, but the rule is that if a game can be played, it will be. I do have to wonder, though. Monday night, the Mariners’ paid attendance was 9,808, the lowest in the fourteen years they’ve been playing in their current stadium (I can’t find attendance numbers prior to that, but the odds are good there were a few games where they drew fewer fans.) Keep in mind that “paid attendance” includes season ticket holders who don’t bother to show up, so the number of actual bodies in seats was undoubtedly lower. Those who did show up got to see this year’s final start by one of the Mariners’ hottest pitching prospects, a close ballgame through eight innings, capped by rookie Abraham Almonte’s first major league home run — and a Mariners’ loss to Houston, the worst team in baseball, thanks to a ninth inning pitching meltdown. Tuesday, the paid attendance improved to 10,245, but apparently the Mariners failed to show up to play that same Houston team. They were behind 1-0 after the first pitch of the game and 6-1 after three innings. It only got worse from there. By the eighth inning, the score was 10-2 and the estimated actual attendance was down to 2,000. By the time the Mariners came to bat in the ninth, it was 13-2, and reports suggest that less than a thousand spectators were still there to see the Mariners get the leadoff batter on base before going pop out, fly out, line out. It makes one wonder if the game would be called on account of disinterest if the last fan left. But you know what? We’ll never find out. Despite all arguments on the side of sanity, people will continue to show up, and some of them will stick around until the final pitch is thrown. Did any of those last thousand or so spectators really think the Mariners would score 12 in the ninth to win the game? Or 11 to go to extra innings? Or even one run? Probably not. I’d even be willing to bet that the majority of them winced when Zunino was hit by a pitch — not because they sympathized with his pain, but because it extended the game. But they’ll show up anyway. Some of them will show up for the chance that they might see a miracle (Giants fans almost got one last week, when Petit missed a perfect game by about 2 1/2 feet). Some of them will show up in the hope of seeing something they’ve never seen before (it happened Monday night, when a run scored on a foul ball after the fielder’s throw hit the batter). One or two of them will show up because they’re emigres from Houston and it was the only day they could get away to see their team. Hell, some of them will show up because it’s a chance to get outside in gorgeous weather. And no matter how the game turns out, some of those people will be there from the beginning to the end. For the teams, baseball is a business. They have no loyalty to the fans or the city they’re in. If they think they can make more money by moving they will — just look at the current five-way battle between the As, MLB, the Giants, the city of Oakland, and the city of Fremont. It doesn’t matter. As I’ve been saying all season, for the fans baseball isa religion. Services are held 162 times a year, and the faithful will come to worship. Their reward isn’t in the next life, it’s tonight, next week, next month, and next year. By the time you read this post, I’ll be out of the house and on my way to a baseball game. My Mariners are in town for the last time this season. They’ve got three more games against the As–the last three games of the season–but since those games are in Seattle, this is my last chance to see them live this year. The As are 71-54, fighting with Texas for the division lead. Even if they lose the fight, they still have an excellent chance of making the playoffs. The Mariners are 58-67, fighting with Anaheim for third place in the division. It would take a minor miracle for them to finish the season at .500; they’re pretty much right on track to match last year’s 75-87 record. The game is at O.co Coliseum (no, that’s not a typo, it really is “O.co”), one of the grungiest stadiums in all of baseball. And yet, I’m still happy to be going. Despite what MLB says, until there’s a team in Portland or Vancouver, Oakland is the Mariners’ natural rival, not San Diego. There are still stories to follow. On the Mariners’ side, will Rauuuuuuuul break the over-40 home run record? Counting today, he’s got 37 games to hit 10 more. Five more would give him the over-41 record. Will their second baseman and short stop of the future avoid another “learning experience” in the field? Errors are a fact of life, especially for rookies. But do they have to come in clumps like this? How long will Nick Franklin, the 2BotF, be out of action after taking the As’ catcher’s spikes in his shin last night? Will their number two pitcher show up with a seven inning, one run performance like his last start, or will the imposter who gave up six runs in the previous game show up? Across the diamond, the As specialize in building teams of no-names and getting top performances out of them. Will an emergency call-up come out of nowhere to astound? Will Josh Donaldson continue his assault on a .300 batting average and .900 OPS? Will Coco Crisp’s wrist hold up? For that matter, will former Mariner, now A, John Jaso recover from his concussion and get back into the As lineup? He hasn’t played since July 24, and may be out for the rest of the season. 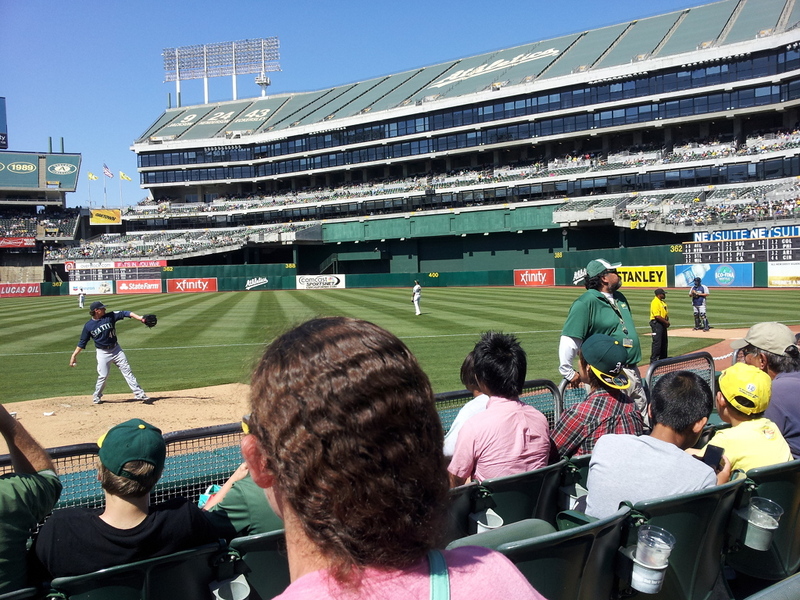 (Jaso took foul balls to the head on the 23rd and the 24th. Who says baseball isn’t a violent game?) How long will the As’ other catcher, Derek Norris, be out after fracturing a toe when he got his spikes caught in Nick Franklin’s shin last night? There’s cause for depression (a 4-4 record on this road trip so far) and optimism (those 8 games were against three of the best teams in the league, and had the Mariners avoided a couple of mental lapses, the record on this trip could easily have been 6-2). Depression: Why can’t the Mariners manage to pitch, hit, and field in the same game? Other teams do it. Optimism: At least they manage two out of three most days. That’s more than we could say a couple of years ago–or even at times earlier this year. But the bottom line? It’s baseball, damn it! I promised you all another baseball post “towards the end of the month” and here it is, just in time. Happy July 32nd, everyone! Jokes aside, I wanted to hold the post until after the so-called “Trading Deadline” so I could try and put the activity in some kind of context. For the record, I spent a chunk of time writing this post in the context of a holiday, but it just didn’t work. The Trading Deadline isn’t a holiday, it’s just a mile-marker somewhere between Independence Day and Thanksgiving. Chronologically, it’s probably closest to Labor Day, but let’s face it, Labor Day isn’t really much of a holiday these days (though that may change around here depending on what happens with BART and the Bay Bridge; that’s a topic for another day, though). So what is the Trading Deadline, anyway? From the name, you might think that it’s the last chance for teams to trade players. You would be wrong. Oddly enough though, this isn’t one of those “religious weirdities” like the timing of the All-Star Break. It’s actually a symptom of peoples’ inherent laziness. July 31 is really the “Non-Waiver Trading Deadline”. Up until 4:30 Eastern time yesterday, if teams wanted to trade players, they could just work out the details of a deal and do it. From now until the end of the season, though, the players have to clear waivers. Waivers basically means that every team in baseball gets to meddle in the dealmaking. This gets ugly to talk about in the abstract, so let’s use an example to make it concrete. The Mariners desperately need a pitcher. In a fit of insanity, they call up the Giants and say they’re interested in Barry Zito*. The Giants, no fools they, agree that sounds pretty good. They’d love to get rid of him and get something in return, but since it’s July 32, they can’t just cut a deal. Instead, they put Barry on waivers. Now every team in the major leagues (including the Mariners) can say “Sure, we’ll take him.” In this case, since the Mariners and Giants are in different leagues, all 14 National League teams and five American League teams would have a chance to speak up before it got to the Mariners. The Mariners are probably out of luck; even if nobody in the National League wanted him, somebody would probably claim him just to prevent the Giants from getting something good in trade. The Rockies are division rivals with the Giants, and they’re thinking that if the Giants get rid of Zito and possibly pick up a decent hitter, they’re going to be serious trouble. So the Rockies make a claim on him. Now the Rockies have two days to arrange a trade. They’re not really interested in Zito, and they’re certainly not interested in picking up the rest of his contract (around $7,000,000 for the rest of this year and $18,000,000 for next year, or $7,000,000 to make him go away). So they don’t offer much, and the Giants say “screw it.” They can either pull him back off waivers, or they can wash their hands of him. If they wash their hands, the Rockies pay the Giants a nominal fee ($20,000) and they’re stuck with Zito. If they pull him back, they can always put him on waivers again–but if they do, they can’t pull him back a second time: they have to either work out a trade with the claiming team or just give him up. As I said, that’s a mess. You can see why people just call July 31 the trade deadline and let it go at that. Surprisingly enough, trades do happen after the non-waiver deadline, but they’re not as common as before. Incidentally, there’s another trade deadline as well: any player traded after August 31 cannot play in the playoffs. Naturally, trades are even rarer in September than in August. So what did all of this mean for Our Team (the Mariners)? Absolutely nothing. The Mariners are apparently following Polonius’ advice (“Neither a borrower nor a lender be…to thine own self be true”). They neither traded away Rauuuuuuuul (or anyone else) for prospects nor sacrificed prospects for a player who might help them now. Well, OK, they traded Robert Andino to the Pirates for the famous “Player To Be Named Later” or cash. But that hardly counts as Andino has been in the minors since late May and most people had forgotten he was even with the Mariners. That discussion of hope from a couple of weeks ago still applies. Where are we with that? Well, they came up a little short on continuing the hot streak after the All-Star Break; rather than being no worse than four games under .500 at the end of July, they’re actually seven under and will need to go 31 and 24 the rest of the way to reach respectability. Not impossible, but not likely either. So what do we hope for now? Well, we can watch Rauuuuuuuul go after that over-40 home run record (though it should be noted that he hasn’t hit one since the All-Star Break). We can continue to enjoy the development of their infield; their hot bats may have cooled off a little, and they’re having a few off days here and there, but still a big step up from recent memory. We continue to keep our fingers crossed for the young pitchers developing in the minors. We start thinking about possible trades next winter. And we keep waiting for a miracle.